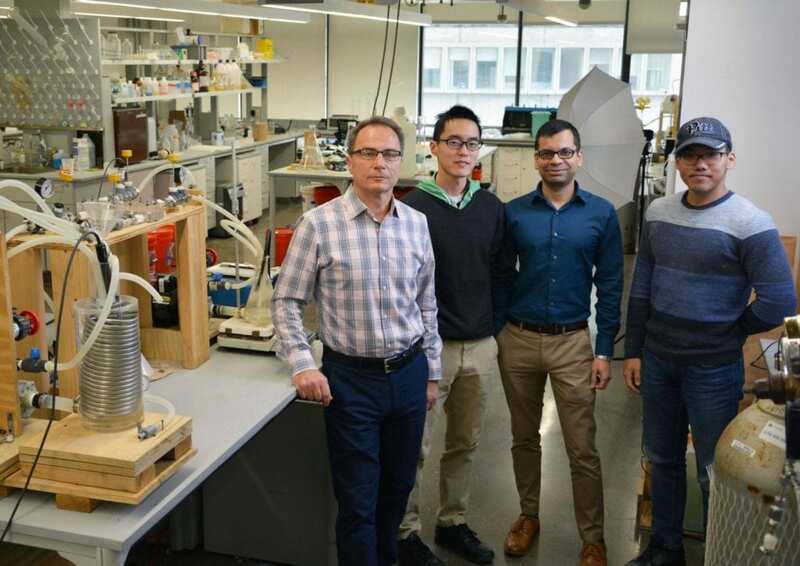 PITTSBURGH (October 30, 2018) … Research led by the University of Pittsburgh's Swanson School of Engineering may have cracked the code to not only greatly reduce the amount of fresh water used in the multi-billion-dollar hydrofracturing industry, but also leverage the waste heat available at drilling sites and natural gas compressor stations to safely treat shale gas wastewater (SGWW) for reuse. As part of "Deploying Intensified, Automated, Mobile, Operable, and Novel Designs (DIAMOND) for Treating Shale Gas Wastewater," a $5.3 million award from the Department of Energy (DOE) RAPID Manufacturing Institute, the Pitt team was awarded $1.76 million to conduct pilot testing of membrane distillation technology in the Marcellus and Utica Shale. Collaborators include Texas A&M University, University of Texas at Austin and U.S. Clean Water Technology, while industry partners are Pittsburgh-based EQT and Aquatech International, Boston's Gradiant Corporation, and Glen Allen, Va.'s Markel Corporation. Additionally, a $0.7 million DOE award to Gas Technology Institute (GTI) will support efforts by the Pitt team ($0.445 million) to expand this study to the Permian Basin of West Texas. Leading the research is Radisav Vidic, the William Kepler Whiteford Professor and Department Chair of Civil and Environmental Engineering at the Swanson School, with co-PI and Associate Professor Vikas Khanna. "Hydrofracturing, originally developed to drill for oil deposits deep within rock formations, has in the past decade created a new energy boom in the U.S. thanks to its use in natural gas extraction, especially in Pennsylvania and Texas," Dr. Vidic explained. "However, the vast amounts of water needed to fracture or "frack" the rock formations and extract the fossil fuels both wastes a valuable resource and results in wastewater contaminated with various salts and metals. This water is either shipped offsite for disposal, or is reused as a fracking fluid at a new well." One key element of the DIAMOND mobile treatment is a membrane distillation technology, which has not been practical in the past because of high energy intensity and cost. "We have been working to adapt this technology to SGWW for more than 5 years and have obtained excellent results in the laboratory using real wastewater to produce very high quality finished water. Membrane distillation requires heating the feed wastewater, which is extremely expensive," said Dr. Vidic. "However, the unconventional oil and gas industry generates a great amount of waste heat during compression or flaring of excess gas. Instead of losing this heat to the atmosphere, we can use it to power the membrane distillation on site making the process economically very promising." "A unique aspect of this project is a systems-level integration of waste heat sources with SGWW generation locations to identify and exploit regional synergies and opportunities for utilizing the waste heat to treat SGWW," said Dr. Khanna. "This is a win-win scenario where we are using available unexploited waste heat to treat SGWW and simultaneously producing high quality water that could be used for agriculture and other industries. "Rather than building treatment units at individual drilling sites or a large centralized treatment facility in the Marcellus and Utica formations in the Northeast or the Permian Basin in the South and Plains states, we can modularize the process. This has the advantage of reducing capital investment as well as the need to transport SGWW to a centralized treatment facility," Dr. Khanna said. "This enables us to create a flexible and adaptable framework for natural gas-producing companies to access on a site-by-site basis." Because the U.S. Environmental Protection Agency prohibits the disposal of SGWW in any body of water, Dr. Vidic notes that effective, economic disposal is a pinch point for industry. "Our preliminary experimental and techno-economic assessment studies have shown promising results for economical and environmentally conscious management of SGWW using membrane distillation," said Dr. Vidic. "In Pennsylvania, for example, drillers may use wastewater to frack the next well, but when you run out of new wells to frack, you still need to deal with SGWW that is generated by the producing wells. Meanwhile in a drought region like Texas where water is an even more precious commodity, the wastewater is disposed of in deep wells, Dr. Vidic said. "In either case, transporting freshwater and wastewater back and forth is not only expensive, but unsustainable in the long term. Our collaborators are greatly vested in this technology because it is more economical and sustainable, and reduces risk to the environment, while securing our country's vast energy resources for decades." In December 2016, the Department of Energy announced the establishment of the 10th Manufacturing USA Institute, representing a critical step in the federal government's effort to double U.S. energy productivity by 2030. The Rapid Advancement in Process Intensification Deployment (RAPID) Institute is focused on addressing the barriers listed above to enable the development of breakthrough technologies to boost energy productivity and energy efficiency through manufacturing processes in industries such oil and gas, pulp and paper and various domestic chemical manufacturers. RAPID will leverage approaches to modular chemical process intensification (MCPI) — such as combining multiple process steps such as mixing, reaction, and separation into single more complex and intensified processes — with the goal of improving productivity and efficiency, cutting operating costs, and reducing waste.